← The Worst Mischief Ever! i think that you are very beautiful Scratchy , but Bongo said that person was too busy to write about his adventures and that we could only see him on FB…so why are you on Bongo’s blog? Also I might add that if Bongo ever finds out he will give you what for!! so watch it!!! Awww Scratchy you’re furry cute but Bongo might not be too impressed at you using his blog! Don’t worry, whee won’t tell! Very Halloween-y, Scratchy! Have a fun day! Happy Halloween to you all. p.s. did you know it was National Cat Day yesterday? Hai Scratchy! *pawwaving* How’re you? I missed your post! Your fur looks gorgeous with the orange color! The 5th will work fine. But what cat are you talking about? Scratchy!!! Scratchy you look perfect! 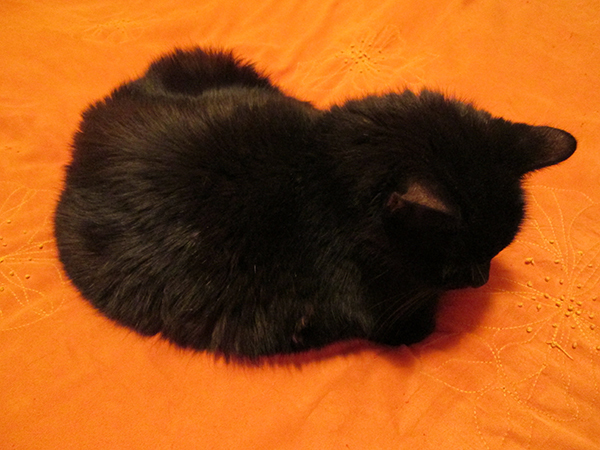 Love how the orange reflected off of your perfect black furs! Thanks Mag. All the better to beat Bongo with. Sending cuddles back to you. Tigger here…. the collie never let me use their blog…. stinkin collies!